When is Easter . . . for the next 2086 years? Spring is in the air, and Easter is coming up soon! 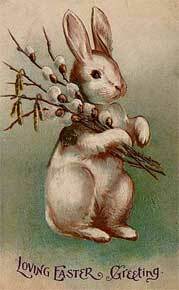 Easter occurs on March 31, 2013, and I’ve heard people exclaim that it’s early this year. I never really remember the date of Easter from one year to the next, but I had vague memories of it being in March not too long ago. Like any good statistician, I started wondering about the distribution of Easter dates. What dates are more common and which are less common? Is Easter in March really that unusual? Even after reading the official definition of when Easter occurs, I still wasn’t clear about the date range. Easter occurs on the Sunday that follows the Paschal Full Moon date for the year. The Paschal Full Moon is the Ecclesiastical Full Moon that occurs after March 20. Huh? So, I’m going to use Minitab statistical software to help find the answers! In this post, we’ll answer these questions about when the Western Easter occurs. In fact, we’ll assess the dates of all Easters that fall within the Gregorian calendar. The Gregorian calendar starts in 1582 and is accurate up until 4099. For once, we won’t be looking at a sample but rather the entire population of the 2517 Easters that fall within the Gregorian calendar! You can get the Minitab worksheet here. And if you don't already have Minitab, please download the free 30-day trial and follow along! When you want to get a quick feel for the data, it’s a good idea to graph the distribution. Below is a bar chart that displays the number of times that Easter falls on any given date. The graph uses codes for the dates on the X-axis. For example, M31 is March 31 and A1 is April 1. By looking at the range of the X-axis, we can see that Easter occurs from March 22 to April 25, or 35 possible dates. The broad middle of the distribution bubbles up and down around the average of 72 occurrences per date. The most common date is April 10, with 102 occurrences (4.05%). The least common day is March 23, with only 14 occurrences (0.56%). Interestingly, the last Easter that fell on March 23 was in 2008. Oh, if I had only understood the heady rarity of that date at the time! The next March 23 Easter won’t be until 2160! You only start to get extremely rare dates for Easter with the earliest three (March 22 – 24) and latest three (April 23 – 25) possible dates. The right tail of the distribution is thicker than the left tail. This indicates that last three dates occur a bit more often than the earliest 3 dates. To illustrate this, Easter falls on the earliest date of March 22 only 0.60% of the time. The last time was in 1818 and the next time will be 2285, which is a span of 467 years! On the other hand, Easter falls on the latest date (April 25) 1.03% of the time. The last such occurrence was in 1943, and the next will in 2038, or a span of 95 years. I hope to be around for that one! Is a March Easter Unusual? My suspicion is that whenever Easter falls within March, people think it’s early. Let’s use our friend the probability distribution plot to determine how often Easter occurs in March. The shaded area indicates that Easter occurs in March about 23% of the time, or about 1 out of every 4 years. So an Easter in March really isn’t that unusual. In fact, we only have to wait until 2016 when it occurs even earlier, on March 27. After assessing the distribution of Easter dates, I wondered if patterns exist. Specifically, if Easter occurs on date X in one year, when does it first occur on date X again? I’ll graph the frequency of the first recurrences below. The first thing that stands out in this graph is that large spike at 11 years. This bar indicates that for 1,141 Easters (45%), the date that Easter occurs in one year will first repeat in 11 years. However, we are in a time period where more Easter dates repeat in 11 years than normal. As the picture below shows, seven of the next 10 Easters repeat in 11 years. But that’s unusually high. It’s always important to understand the larger context of your data before drawing conclusions! The other thing that stands out for me is the relative handful of years in which an Easter date can first repeat. For example, an Easter date cannot repeat in 2 years or 7 years, or any of the other large number of possibilities that are not on the graph. It’s definitely not a random distribution! While the official definition for Easter really didn’t help clarify things for me, I found that normal data analysis methodology provides a very clear picture of when Easter occurs, and what is truly unusual.